Sometimes you just need some comfort. Yesterday was not a great day for me. In fact, it was terrible. Before I got home I decided that a nice, warm, creamy bowl of soup would fit the bill. 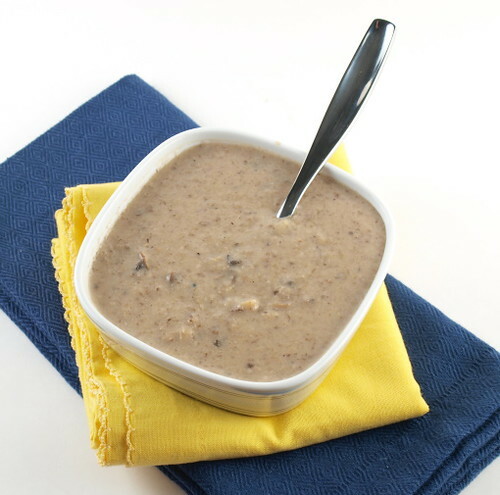 I have been craving mushroom soup for a few weeks, ever since having some rather superb mushroom soup at a local cafe, and I had three pints of mushrooms in the fridge. It was meant to be. 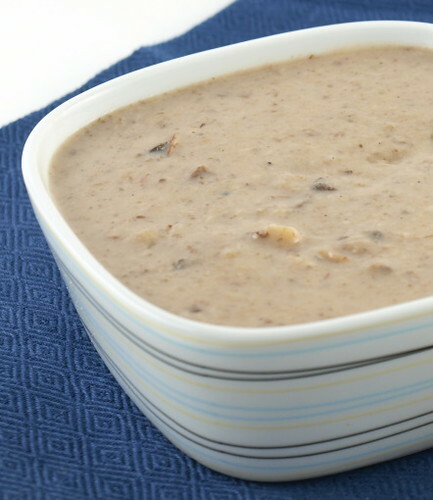 This mushroom soup is pretty basic. I really wanted the mushrooms to be the star so I did not add anything to take away from their robust earthiness. Instead I picked aromatics and herbs to compliment and enhance my trio of mushroom. For this soup I chose button, crimini, and shitaki mushrooms, but you could use just about any mushrooms you wanted. You could also finish this soup off with more cream than I used, but I though that a touch was enough. 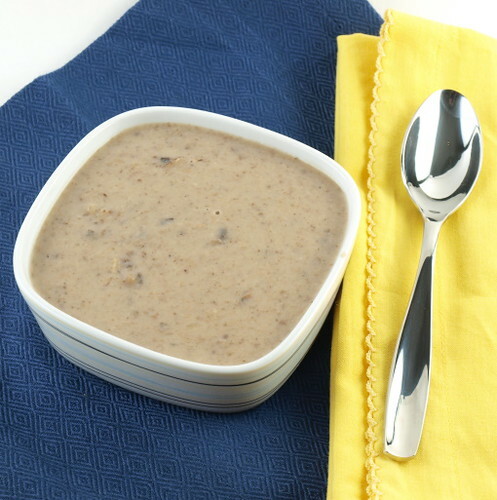 Warm, creamy, and full of flavor, this soup is sure to chase your blues away! 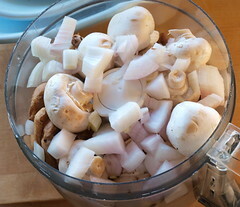 In the bowl of a food processor add two pints of mushrooms, the onion, and garlic. Pulse until the mushrooms are in small pieces, but not blended smooth. Chop the third pint of mushrooms roughly. In a heavy bottom pot over medium heat add the oil. Once it shimmers add the mushrooms, thyme, pay leaf. Season with salt and pepper. 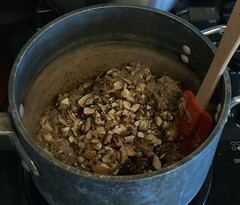 Cook until the mixture starts to look dry, about 15 minutes. 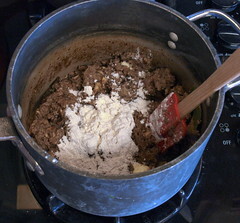 Add the butter and allow to melt, then add the flour and cook until no raw flour remains, about five minutes. 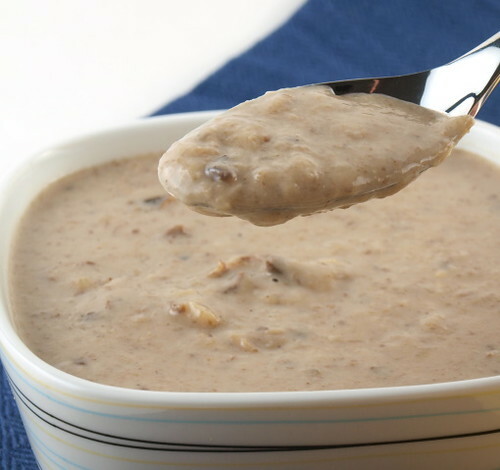 Slowly add the chicken or vegetable stock, whisking constantly, then add the milk. 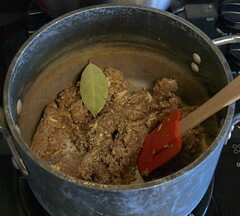 Bring the mixture to a boil, then reduce to a simmer and cook, stirring often, for ten minutes. 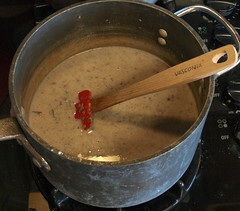 Reduce the heat to low and stir in the cream. Test for seasoning and adjust as needed.